Sometimes when I am at church a Bible verse just grabs me. I mean it just stirs and stirs in my brain and tugs at my soul. I don’t know about you but there are times when verses seem to be written for the season I’m facing. As I come across them via Bible study, quiet reading, or during Sunday sermon, I am consumed by the words. How can words written in black and white, and sometimes red, be so powerful? They can offer you understanding, strength to move forward, power to push away Satan, and love from the Heavenly Father that seems to radiate into your heart. They can also leave you to ponder the way your life is moving. This past Sunday, which was yesterday, time has seemed to go so fast I’ve already forgotten it was Monday. Anyway, Pastor Steve discussed anger and emotions from forgiveness. My oh my how hard is that subject. We all know people who have moved in our lives and then possibly moved out due to our kicking them into next week. How in the world can anyone expect to be forgiven after what they have done to us. I mean, I know a few who have a whole lot of nerve to even begin to seek my forgiveness. Not that they would ask of course, but even for me to consider giving that to them makes my head spin. I have some of these in my life. I’m telling you God better move that mountain if he is asking me to forgive them. I am living proof that just making it to the next day at times is painful enough, but to ask me to forgive. Oh my, oh my. How can I possibly do that after what they did. How can I ask that of myself. I have the right to be mad, hurt, angry, and downright bitter for how it turned my life. But He does. He does. How often when we let that anger, pain, and hurt linger on our souls and our hearts do we notice how it hurts the ones around us. We snap at our kids, because we are angry. But that person we want to aim that anger at is not there. We lay in bed depressed by the hand that was dealt our way, instead of greeting our loved ones in the morning with smiles and love. But that person we want to see all the pain they have caused is not there. The person who we want bad things to happen to, the person who we hold anger and malice toward is never around. We aren’t hurting them. They are not affected by our emotions, but our loved ones are. Our loved ones are taking the brunt of our lack of forgiveness. Wow! Wow! This hit home yesterday. It’s not enough to forgive, but we must not speak ill, we must not wish hurt and disappointment on them, and we must not be angry any longer. We are forgiven and therefore we must extend this to even the worst of enemies. I have said I forgive to God. I have prayed about my forgiving. I have even sent an email to the person telling them I forgive them. But you know in my heart I had not. I was still speaking ill in my mind, soul, and heart. I was still wishing their life was as destroyed as mine. I was hoping they had it worse. And how did this help me? How is it helping me? This needs, no it must stop so that I can let go and move forward, so that I can heal. So that my life is not wasted in bitterness and anger. 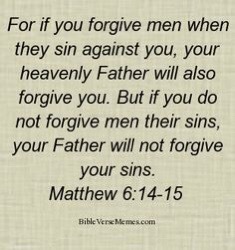 In Matthew 18: 21-22 when Peter asked how often should he forgive his brother who sins against him Jesus replied. This halted my heart. I have been deceiving myself to believe I forgave, so having emotions that are malicious toward that person was okay. Guess what no, that is not what he wants. We must forgive seventy times seven. We must wish good things for them. We must have happy emotions for them. We must be strong in kind hearted thinking so that it is on the inside as well as the outside. Does this mean we must be friends, acquaintances or pals. Ohhhh Noooo. We can separate from those that bring evil and pain into our lives, but we can be kindhearted toward them and pray for them. I have learned that forgiving is only partially what it takes to resolve hard situations. We must also give all the goodness he gives us and put it toward those whom have wronged us. We must place FAITH in God that life will move toward him and forgiving is part of moving forward. Pray tonight that complete forgiveness can be done. Let go of those emotions that are keeping you tied to that person forever. Don’t let them occupy your heart, instead fill it with love and kindness. I know I am going to and every time they return, I am going to demand that they subside and open to God. Next Article Procrastination at its finest. So true! Totally agree…just because we forgive, we are not required to be around those who are negative and hurtful to us.